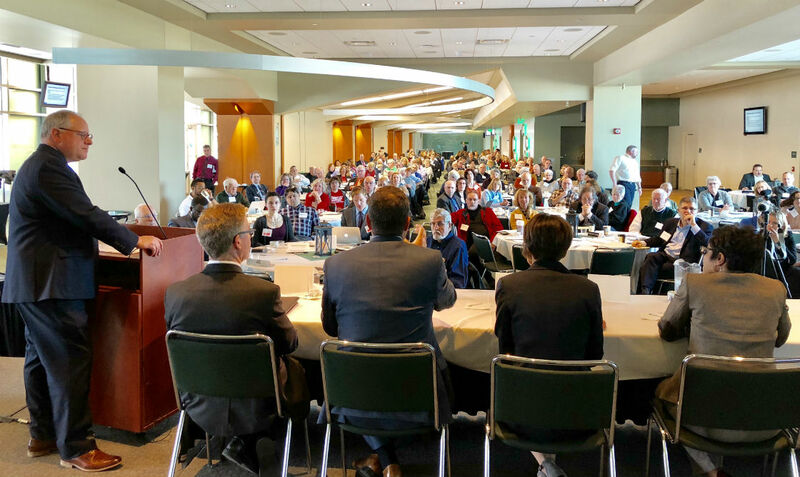 Center for Michigan President and CEO, John Bebow, hosts a panel to discuss solutions to fix the state's infrastructure at Spartan Stadium's Huntington Club on March 14, 2018. Drive on any pothole-ridden street, and it’s clear: Michigan has an infrastructure problem. Solutions, though, aren’t so easy. That’s partly because the cost of a solution, estimated at $4 billion annually, is so vast, according to experts Wednesday at Michigan Solutions Summit sponsored by The Center for Michigan and Bridge Magazine in East Lansing. “We are in peril at a variety of levels,” from roads, to water and sewer, to the state’s electrical grid, said John Walsh, state budget director under Gov. Rick Snyder. The term-limited governor is pushing for fee increases to help pay for some of the improvements, including increasing fees to $4.75 per ton to dump trash in landfills to raise $79 million to replace an expiring bond fund used to clean up contaminated sites, and a $5 water surcharge to all state residents to raise $110 million for drinking water repairs. The measures face a murky future in the state Legislature. Mike Nystrom, executive vice president of the Michigan Infrastructure & Transportation Association, said term limits make it difficult to come up with solutions because of the turnover in lawmakers. Related: 2018 Michigan Solution Summits ‒ Reserve your seat today! Nystrom said he would like a 1 percent sales tax increase to raise more than $1 billion for infrastructure. That, however, would require an amendment to the state constitution. Another possible solution: Public-private partnerships, which “are a new way of investing in government infrastructure, and we have to be open to those opportunities,” Nystrom said. The state launched a pilot program intended to inventory the location and condition of multiple infrastructure systems across the state, with hopes it could lead to coordination among agencies such as road commissions and utilities. That could prevent a road from being torn up twice to repair pavement and, later, to fix something underground, Walsh said. Nystrom criticized the road-funding plan the Legislature passed, and Snyder signed, in 2015, for taking too long to be fully implemented when roads are in crisis now. The plan will raise $1.2 billion for roads by 2021, with half from diverted general fund dollars and half from new revenue from higher gas taxes and vehicle registration fees. Several panelists said the solution isn’t necessarily more money. Snyder appointed his 21st Century Infrastructure Commission, which in 2016 released a report with recommendations to fix Michigan’s failing infrastructure. The report included ways that government can be more efficient when it comes to infrastructure, including new technology that can improve how roads are built, panelists said. Joi Harris, vice president of gas operations for Detroit-based DTE Energy Co., said the utility is working to find more cost-efficient operations to avoid raising rates. “Our teams are scouring the country, and even outside the country, to find ways to do this work more efficiently,” Harris said. Michigan’s economy is improving. But suburbs may face next fiscal crisis. Why don’t Michiganders trust government? Let’s count the ways. When I came to Michigan in the 1980s, my new neighbor greeted me with "welcome to Michigan the land of busted concrete and cold patch". Michigan doesn't know how to build concrete roads for cold weather. Contractors insist on placing mechanical seals in the expansion joints. I call them "Pothole worms" because they creep out of the expansion joints and allow water in the joint which freezes and cracks the joint making a pothole. Lately some have been sealing the joints with a liquid sealer composition unknown to me, which is preventing potholes. MDOT needs to wright specifications for proper road bed drainage and joint sealing. This could possibly make such roads last 50 years or more. Raising Sales taxes to pay for roads is a TERRIBLE idea!!! Especially the way our sales tax is currently structured. Most Michigan retailers are already struggling against out of state on-line venders because of our high rate (driven by food, medical and service exclusions). This makes it only get worse! Gas and vehicle taxes reflecting driving and vehicle characteristics is the only fair approach ... but the voters spoke. Coordinating road repairs with utility improvements should have been done years ago. Currently we get stuck often twice paying for road repairs - once through our taxes and a second time through utility bills. The revenue shortfall can be addressed by removing the sales tax on fuels, increasing the fuels taxes, and expanding the base of the sales tax to include services. There will also be need for appropriations from general revenues. The knowledge exists to build roads that will last for decades here in Michigan. The problem here is that the politicians and contractors have this "relationship" that make such a business model undesirable due to its affect on their revenue stream. Ever wonder why road longevity is never discussed? Why else would a talking head for building contractors be pushing for a politically suicidal sales tax hike? Address the problem with planned obsolesce playing a significant role in that business model for road building, and you'll be going a long way towards remedying the infrastructure problem. Thank you for highlighting this very important issue. The lack of transparency in MI government needs to STOP. If this is a government for the people and by the people, those voted into government work for us. I would recommend people attend the "Bridge Solutions" conferences that are ongoing to hear and understand the "reality" of the current state of Michigan. How Michigan ranks in all aspects of government, infrastructure and quality of life indicators(and it is not good). Yes, Michigan has had some difficult economic years, our economy is still not diversified, but the current administration and legislators rigged the elections through gerrymandering to get their agenda (not the people's agenda) passed. The "business tax break" which was to attract more "business" to MI was totally misrepresented. Sure you give tax breaks to business owners who over the last several years have not let that "trickle down" to workers, but to enrich themselves. What new business wants to come to a state where the infrastructure is falling apart, the educational system is at the bottom of all states, and state government is working in a "bubble of denial" of what is really going on. The only ones in the past several years who have benefited from this governor are the lawyers who have engaged in lawsuits from both sides of the aisle because our government is NOT WORKING for the PEOPLE.